A new study, by the University of Iowa, presented at the American Society of Human Genetics, has specified that smoking and alcohol is linked to epigenetic changing causing accelerated aging. The research institute analyzed patterns of DNA methylation from data available from the Gene Expression Omnibus. Previous studies have revealed that methylation patterns change as people age, in response to environmental exposures. Two specific genome locations have been involved with methylation changes highly associated with smoking and alcohol consumption. These include base pairs cg05575921 on the AHRR gene and cg23193759 on chromosome 10 and DNA methylation at these locations was a better measure of substance use than self reported substance use habits. In this study methylation levels were used as an estimate for tobacco and alcohol consumption with its link to premature aging. Each person’s biological age was estimated using a previously validated epigenetic “clock” based on methylation levels at 71 locations in the genome, as measured by the widely used Infinium HumanMethylation450 BeadChip. The difference between biological age and chronological age was calculated and the relationship between tobacco and alcohol use and premature aging was assessed. All levels of exposure to smoke were associated with significantly premature aging. 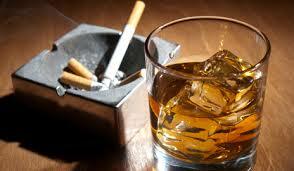 High and very low consumption of alcohol was linked to accelerated aging. “Being able to objectively identify future smokers and heavy alcohol users when they are young, before major health issues arise, can help providers and public health practitioners prevent future problems, improve quality of life, and reduce later medical costs,” Dr. Philibert added.